White fringed beetle (Naupactus leucolom) larvae (grubs) are white or cream colored, C-shaped, and feed on plant roots, including those of tobacco. 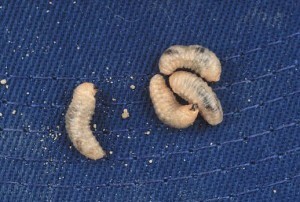 The grubs have no legs but have a distinct head capsule. The adults are flightless and parthenogenic, meaning that only females are present. White fringed beetles are an invasive species in North America and were first detected in Florida in 1939. They were first found in North Carolina in 1942, but are not widespread. Limited adult white fringed beetle movement and soil dwelling larval habits have slowed their spread throughout North Carolina. 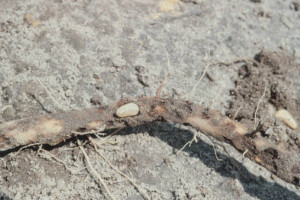 However, in fields where they are present, their damage is similar to that of wireworms, but much more extensive and intense. Sweet potato, white potato, peanuts, soybeans, and cotton are all susceptible to white fringed beetle damage. White fringed beetles overwinter as larvae and feed on roots. Adults emerge in July, and there is 1 annual generation in North Carolina. Adults will feed on leaf tissue, but this feeding is usually minor. There are no established thresholds for white fringed beetles in any of the crops they feed on. Insecticides do not appear to be effective against white fringed beetle larvae, and they can persist in the same field for several seasons. Small grains and corn are less susceptible to white fringed beetle damage and may be suitable rotations. 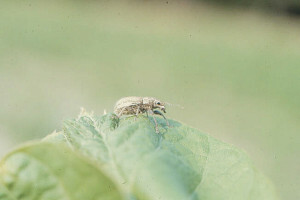 Fields with large white fringed beetle populations are likely not suitable for tobacco production.